And there I was thinking it was all about lollipops and sweeties. Just shows how wrong you can be. Hopefully they will dress up like the Bar Maid. Jesus could dress up as a zombie. Wait, Jesus is a zombie. Christianity will eat your brains. Mo should dress up as a portrait of himself. 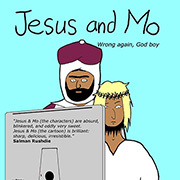 Jesus and Mo should go as each other: Jesus as Mo and vice versa. (Hopefully they’ll endulge in a lot of vice)! Very funny! This one is classic. William, that’s scarier than anything. So glad the intelligence agencies actually come through sometimes. … And the thing about the Mohammed-crisis is that they (the pissed off muslims) have no chance of drawing stuff that would make us angry and make us want to declare jihad. I don’t understand Danish but I expect that the picture accompanying the headline “SuperBest fanget i ny svindelsag” is a picture of one of the terrorists from the article in William’s Link. I feel this is pertinent. Love your strip and the fact that despite the reputation it is actually one of the more respectful sites out here, in terms of editorial content at least. Please do a strip about the recent French decision on scientology. Well done my froggy friends! these two are complaining about luring the feebleminded? more like jealous that halloween is better marketing with a verifiable instant pay off for not a lot of effort! All Hallows Eve is my fave “holiday” of all – not just because it’s only a holyday to pagans, but moreso ‘cuz it is My Birthday – yep, 7:20 p.m. Amer’can CST, 1959. No question the best day of the year to be born on since the whole Western world parties with you – at least in SPIRIT! This being the Big 5-0, will be pulling out all the Stops. So Go with it, and me, my fellow infidels. @Bucketboy. Thanks for the article. I am surprised that there is any room for maneuver here. I guess that the difference between a cult and a religion is nothing more than political clout and what we are witnessing in scientology is the transition stage. Fascinating. It should be studied. 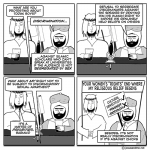 Finally another comic strip who gets it…..